The breeze has a bit of a crispness to it, the sun sets a little sooner each day, and the farmers’ markets are brimming with fresh produce. Yep, it’s officially fall. And that means one thing and one thing only: it’s football season! For those of us dwelling in Salt Lake City, our closest contact with football season is the University of Utah Utes. The whole city–restaurants, bars, and fans alike–don their red gear to support the local team, creating a city-wide feeling of pride and support. I’ve been a Ute football fan since the wee age of 9 months old and have attended nearly every home game since. One thing I’ve learned in my nearly three decades of Utah football is that it’s hard to be a good fan on an empty stomach. The food vendors at Rice-Eccles Stadium also change from season-to-season, meaning that last year’s MVP of places to eat might have been kicked off the team this year. So here’s a guide to the food at the University of Utah football games at Rice-Eccles Stadium. 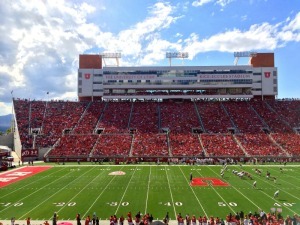 Rice-Eccles Stadium during the Utah v. Fresno State game. 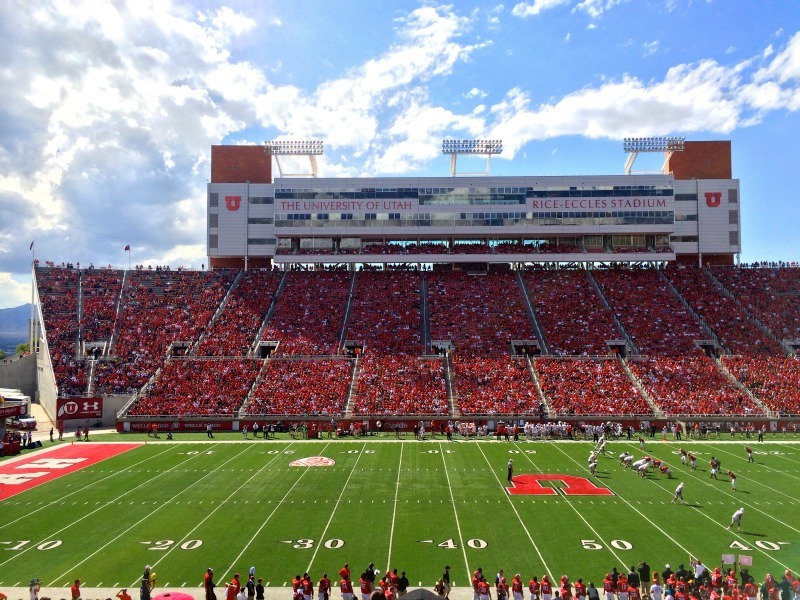 Rice-Eccles Stadium opens to ticket holders two hours before kick-off. Vendors are ready to serve fans so arrive early and come hungry. But don’t forget that there is no re-entry, meaning once you leave the stadium, you’re out for good. Also, no outside food or drink (with the exception of one factory-sealed water bottle) is allowed in the stadium. And trust me, security will search your bags upon entry. Vendors close around the end of the third/beginning of the fourth quarter, depending on the availability of food. Some vendors do last minute specials, like two for one, during the fourth quarter. Most vendors accept cash and credit cards. This season, most of the vendors in the stadium are affiliated with the university, with only 7 local vendors (down from last season’s 20). That means majority of the food throughout the stadium is the same, especially at the permanent stations. They’re serving up regular concession stand fare like hot dogs ($5), brats ($6), soft pretzels ($5), churros ($4), nachos ($5 or $9 with barbecued meat), popcorn ($5 for small, $10 for large in souvenir tub); plus BBQ sandwiches (beef, pork, or chicken, $7). The menu of the Utah Concessions, as most are called, vary slightly throughout the stadium. In addition to the above, a few places serve hamburgers/cheeseburgers ($7, add $3 for fries), bacon and mushroom burger with fries ($12), fries ($5), and chicken strips ($7, add $3 for fries). The chicken strips and fries tasted like typical mass-produced concession stand food probably straight from the freezer, but it was better than being hungry. 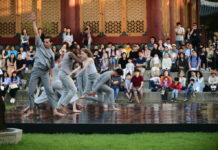 A better bet is to stick to the outer ring where the free-standing food kiosks are located. There you’ll find stands selling nachos ($5 for regular, $8 for “super”), Kettle corn ($8), pizza ($7 for personal size; pepperoni or cheese), Bavarian specialty pretzels ($5), and Chile Verde Burrito stands. Chile Verde sells enchilada and taco platters ($11/each), quesadillas with chicken/carne asada and a mound of toppings ($9), bean and rice burritos ($6), California burritos ($11), taco salad ($11), and super nachos ($11). This is one of my family’s favorites. 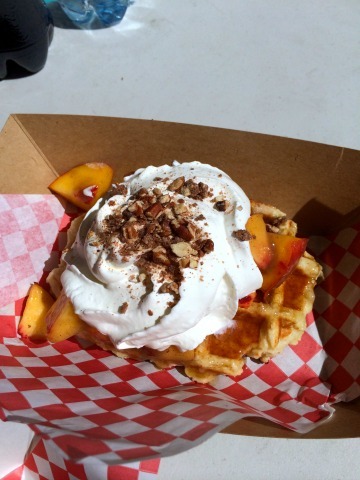 The peach cobbler from Saturday’s Waffle at the University of Utah football game. An even better bet is to head down to the south end zone is where most of the local vendors are located. Wriggles Wraps sells shredded chicken, shredded pork, and hummus sandwich wraps ($8/each). They try to keep their line moving quickly, especially at half time, so head there when you’re in a hurry. Cowboy Corndogs sells regular corn dogs ($6) and spicy ones ($6), but they only accept cash. Saturday’s Waffle, usually seen in food truck form, sells chicken and waffles (conveniently on a stick, $7), plain waffles ($4), fries ($6), and peach cobbler in waffle form ($9). I tried the chicken and waffle with maple dipping sauce and it was a perfect combination of sweet and savory that was easy to eat while watching the game. This is definitely going on my list of candidates for this year’s Vendor Heisman Trophy. If you’re looking for sweet without savory, The Sugarhouse Donut Company serves bags of mini powered sugar donuts ($8) or the “Ute Special”–donuts topped with strawberries and whipped cream ($10). And finally, there’s Yoshi’s, serving rice bowls, like chicken teriyaki ($8), sweet-n-sour Hawaiian ($8), spicy teriyaki (“Raging Bull” $8), shrimp tempura ($9), gyoza ($5) and even a tempura shrimp sushi roll ($9). Yoshi’s has been my go-to at half time, especially when it’s cold, for a deliciously filling and easy to eat refueling. There are four more home games this season. Tickets are available here. Don’t forget that your ticket doubles as a free pass on Trax, FrontRunner, and all UTA buses on game day. Parking is available, but scarce. 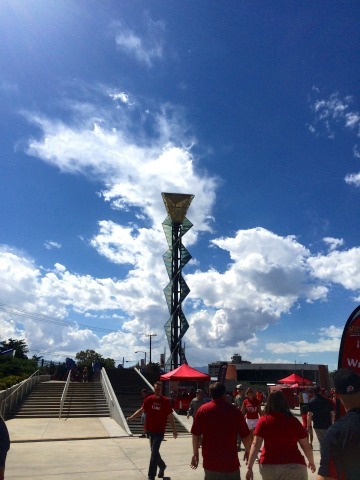 The Olympic torch in the south end zone at Rice-Eccles Stadium. Tailgate, the huge party in the parking lot that starts hours before the game, is huge at the U of U games, but it’s not a free-for-all. Season-long tailgating passes must be obtained before the season and individual passes might be available depending on the game (check here). Without a pass, fans are welcome to stroll through the tailgating lot, but be aware that the parties are all private. There is no shortage of food at Rice-Eccles Stadium so keep your stomach full and your cheering loud. And most importantly: Go Utes!